Isn't that just gorgeous? Although green is my least favorite color, the chartreuse just jumps out at me and gives me a wink. This block was selected in my Simply Solids Bee for September by Michelle and I couldn't be happier to make it for her. It has punch, it has character and it's new (at least to me). Although I've been quiet, I've been busy and my sewing machine has been a humming so stay tuned for updates in the near future and hope you are enjoying this last week of August - this year is flying by! The Simply Solids Bee is one that I am happy to say, I am still loving! Sometimes after a few months, it's a chore to get the fabric in the mail and make another block. Not the case with this bee! In fact, one my friends is also in Simply Solids, but another group and she asked me to make a couple of blocks for her so she would get more variety, because, you know---you only have so many solids and I think she is making an extra 8 blocks to go with the 11 from her bee mates, so of course I said yes! She's my friend and that is what friends do. 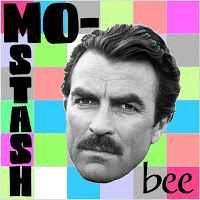 My girl, January, is in the Modern Stash Bee with me, but we aren't in the same hive. Funny thing, we are both the Queen Bee this month and doing the exact same thing as last time. You see, for the first half of the year, I asked for the Octagonal Orb Block (and they turned out so pretty) and for this second half, I asked for the same thing, so I can have a good sized quilt with these blocks. January did the same thing! She started with yellow and gray Supernova blocks and is adding to her collection to make a large and awesome Supernova quilt. Here is my second contribution to her quilt. You can take a peek at the first one I did. You can tell I really like the Groovy fabric for this block! (I think it's the color combo). Teressa, this month, asked for the Churn Dash block in my Simply Solids Bee. You know, funny thing, this churn dash. I have never liked this pattern but in the last couple of months, I have done a 180 and it's lovely. It was great to make this for my bee mate. As a matter of fact, I have a special project where I owe a block and I made a....guess it...churn dash! For my special project I had to utilize my math skills to make it into a 9" block (finished). Always remember the seam allowances! 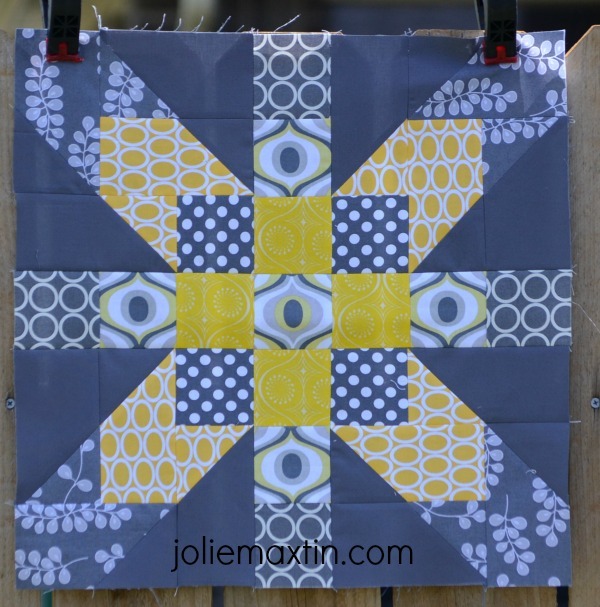 The easiest tutorial I have ever seen for this block, was presented by the lovely Jenny at Missouri Star Quilt Company. She makes everything seem so easy, and really it is! Check them out when you need some inspiration and if you have any pre-cut bundles laying around, she'll be able to inspire you to whip it up into something fabulous in no time at all. Make Up Bag for the Sista! When my sister got married earlier this summer, her make-up bag left a lot to be desired. The zipper was broken and it was stretched out and frankly, she just needed a new one. I loosely measured it with my flip flop to remember the dimensions she wanted and told her I would stitch one up for her. Well.....that didn't work as I had envisioned. It being a "loose" measurement combined with losing quite a bit of space when I boxed the bottom corner meant the first bag was just too small. One other "whoops" was that I used the duck cloth I had bought locally and it just wasn't heavy enough so the bag couldn't stand up on its own. Luckily, my stash includes 4 yards of very heavy duck cloth (from an online supplier) so I started over to make another, larger, one. The lining is a whimsical, happy cupcake pattern that I hope makes her smile each time she opens it. She is going to get both of them as I'm sure she can use them. Happy Birthday Sis - I love you and wish you many more! Additionally, this project was on my Q3 Finish-A-Long List so I can check it off! Yeah! Summer has been busy, but let's jump right in so I can share with you what I have been working on lately. In the Modern Stash Bee, our Queen, Jana, requested pieces for a row quilt. She left it pretty open and said a 48" row of whatever block you choose, using a low volume fabric for the background. Now you know, you'd think it would be easy but giving us all that design choice/freedom was tough for me. I pondered for a while and then remembered the Summer Sampler I had finished earlier this season and decided on the popsicle. She got 8 popsicles and a wonderful variety from our "Las Vegas Hive". 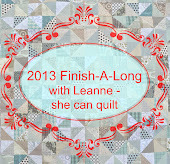 There were whales, swimsuits, pinwheels, hourglass and that is going to be one fabulous quilt! I am honored to have contributed to it.